The arthritis test panel helps screen for rheumatoid arthritis. What is the arthritis test panel? The arthritis test panel measures the CCP IgG antibody and rheumatoid factor blood levels. Why is the arthritis test panel important? This Arthritis Test Panel is a blood test. The arthritis test panel, also known as an arthritis blood test panel, screens markers related to rheumatoid arthritis. This arthritis test panel include the CCP blood test and the rheumatoid factor test. To get an arthritis test panel near you, simply order online and get blood drawn at the selected Quest lab. 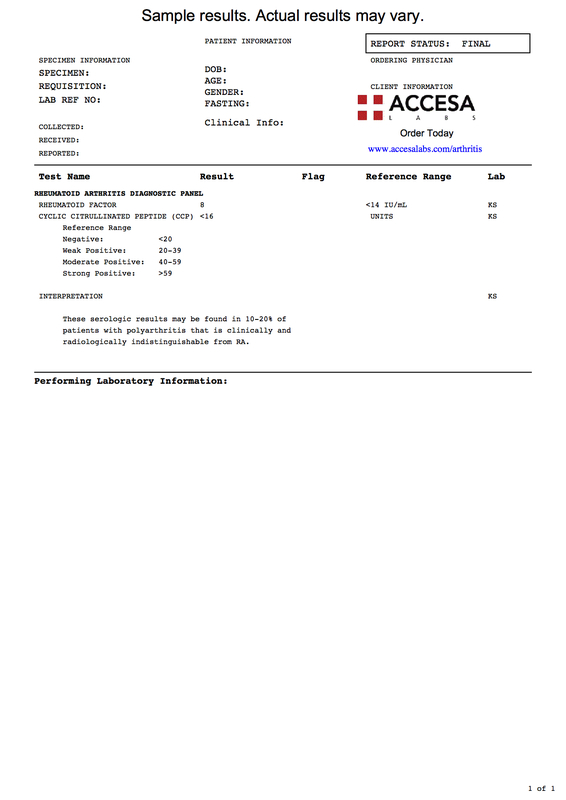 Once the arthritis test panel lab results are ready, they will be available for download. For a more detailed arthritis screening, check out the comprehensive rheumatoid panel. Arthritis Test Panel at Guaranteed Prices.